Late last week, my brain kind of exploded. I should have known it was about time for my annual existential crisis. I have them so regularly that I should start advertising and selling tickets in advance. This one was kind of my boss’ fault. Well. 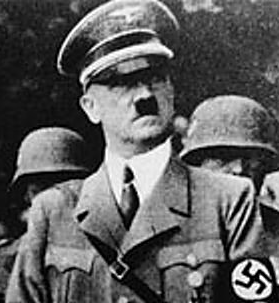 His fault and Hitler’s. Like everything bad in this world. 1. Undergo an evaluation at work in which your boss asks where you see yourself in the future. Take that question a little bit too seriously. 2. Realize you don’t really know where you see yourself. You were kind of just sitting around waiting for whatever the next step in life is because that’s how you’ve always lived. Decide this is not the right way to do things. 3. Recognize that there are a lot of options available to you. 4. Recognize that there is not enough time to try them all. 5. Read a novel about Holocaust survivors. Realize that even if there was enough time to do everything you wanted to do, sometimes you can’t because of circumstances beyond your control. Like Nazis. Sometimes life doesn’t turn out the way we thought it would at all. Because of the Nazis. 6. Spend a few days alternating between being paralyzed by life’s unbearable sadness and the inevitability of death and running around manically, trying to finish projects, experience new things and plan the future before all that sadness and death notice you. Everywhere I looked, something reminded me of all the things I want to do while I still can. I looked at the sky and remembered that I want to be an astronaut. I read a book and remembered I want to write one. I ate lunch and remembered that I want to learn how to stop burning my cereal and maybe one or two other cooking tricks. Every time I thought of something new, I was painfully aware of the seconds ticking by–precious time I was wasting by making jokes about cereal. I started scrambling to fill each of those seconds with something worthwhile, but it was exhausting. It’s hard to seize the day when you’re spending the entire time reminding yourself to seize it. When I sat down and really thought about my future, the problem I kept running into was that I was frozen by my inability to pick one course. I want to do so many different things requiring so many different paths that it’s hard to wrap my tiny brain around it. Obviously there was only one thing to do: I had to make a to-do list for life. This movie had way fewer lists than I wanted it to have. 1. They tend to be cliche. There are websites dedicated to bucket list-building that have to have a “most popular” page because everyone wants to do the same stuff before they die. 2. What happens if you don’t complete your bucket list? You’ll have unfinished business! If Casper taught me anything, it’s that unfinished business is how ghosts are made. 3. What happens if someone you love finds your bucket list after you die? Great. Now your relatives and friends, who were already sad because you’re dead, are even sadder because you didn’t get to do everything you wanted to do. 4. 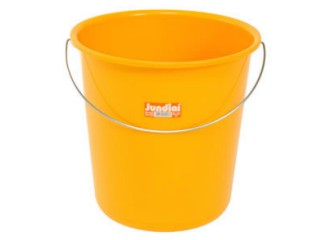 They’re regularly confused with lists of actual buckets. Pails, bucket seats, steam shovel scoops, mop buckets… the list goes on and on. My list is a tiny bit different, though, because I included everything I want to do. Everything. As of now, the list has 145 entries on it, and it’s still going. I have short-term goals and long-term goals on there. I added practical ideas and crazy schemes, heavy thoughts and dumb jokes. Even if one entry contradicts another, I included it. There are things I can cross off tomorrow and things I’ll probably never be able to cross off, and that’s ok. Even though it sounds like a big pile of crazy (but how could an enormous color-coded list in a spreadsheet be crazy? ), it also pulled me out of my funk and helped me get a plan together for the future. Seeing entries that contradicted each other made me realize which ones I cared more about. I found that I can combine a few things (I can listen to books on tape while renovating the amusement park and eating cake! ), which will help a lot because I only have 66-ish years to get it done. The best part about my list, though, is that it’s not going to make anyone sad after I die because I saved it in Google Drive and I have two-step login authentication. Good luck getting into that thing. I sure got a kick out of this post! As usual, very clever, succinct and completely readable. And wow, wouldn’t number 38 be a blast!! Lists of what you plan for the future are all very well…but can come unstuck very easily for all the reasons you give. Recently someone asked me what I plan to do in the future and my reply was – ‘well when I was in my 40s I had a vague plan for the future, but now, being in my 60s, I’m IN that future and it is not what I planned at all (but not in a bad way) so if I got future plans wrong back then, I’d probably get them wrong now….these days I’m just going with the flow.” Take a zen-like attitude and save lists for really important things. This helped me today! Laugh then cry and nod in agreement! It’s funny, but I think if I died now, I’d be happy. Obviously not thrilled, but I’ve had a great, though far from perfect, life. But it’s been an adventure. What an amazing thought it is that there is more ahead. And yes, when I hear ‘bucket list’ I picture a long string of buckets, hanging across the sky. I often fantasized about having kids while having no kids. Then I discovered the joys of a nanny. I also love the concept of having an annual existential crisis – I am going to schedule one of my own right now. Thank you for a great post! Great movie reference. 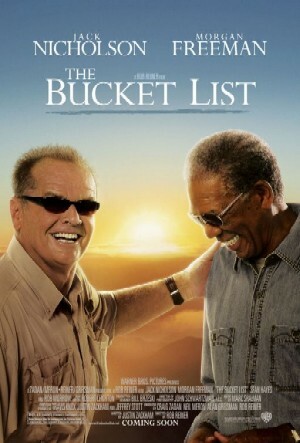 The Bucket List is one my favorites, and one of the most honestly sad movies I’ve seen. Loved this. I struggle daily with what I want to do with the rest of my life but there’s JUST TOO MUCH! So relatable. I like your list for life much better than a bucket list. So much simpler to just list EVERYTHING instead of being an elitist and picking a choice few that have very low probabilities of happening. I can also totally relate to the existential crisis thing. Unfortunately, mine aren’t usually regular, they just pop up at the most inconvenient moments– like when I actually need my confidence. Fantastic bucket list! And I go through similar existential crises often! Making lists, spreadsheets, charts….helps me feel more in control again but a nap is always the best solution to pull me out of a funk! Good advice for early 20 year olds like myself who don’t know what the heck they’re doing with their lives. I like thinking of life like you, a choose your own adventure book. I just decided to crochet “When in doubt, spreadsheet it out,” on a pillow for myself (and possibly future generations). I think your list is an awesome idea – have fun at the amusement park! You are truly blessed, your family loves and adores you…and your favorite Uncle is very proud of you. Your very lucky, you have an Uncle Steve. You should write something bigger, longer, like a short story or book. Put another item on your to-do list! Oh yes… my boss doesn’t even give a dam, and his family was directly affected by Hitler!